Guns. Guns. Guns. Sure, some are used for protection. They’re also used for hunting. Even for Sport. 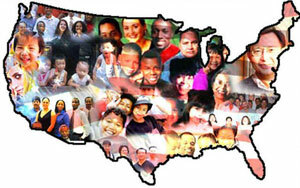 But more and more they seem to be misused as a tool to express prejudice and bigotry, fear, hatred, racism, and crime. I was going to say, let’s try a different track. Instead of removing guns from our society, let’s remove some of the reasons for gun misuse. Let’s ban prejudice and bigotry. Now, from what I understand, prejudice and bigotry are among the reasons that people hate. With America being this “melting pot,” with so many cultures and creeds living, working, playing, socializing together, this is not the place for bigotry. But then look around, look and listen to the rants. Our born in America President is somehow foreign. Muslims can’t be trusted, they are trying to infiltrate us, trying to convert us all to Islam. Trying to impose Sharia Law on America (right, like any law could get passed with this “do nothing” congress). Mexicans and other Latin Americans are invading our borders, taking our jobs. Using our safety nets. These people will never “learn what it’s like to be a real American.” Ok, ok, we’re not going to be able to do that. I was going to say, let’s ban hatred, then. I don’t know, hatred has been around for an awful long time. A lot of people have invested heavily in hate. Some people have hated for so long, they are not even sure why they hate. Hatred is fueled by fear. Fear of the unknown and the known. That something is unfamiliar or just plain different is no reason to fear, but we are kind of lazy and it’s easier to fear and denigrate than it is to learn and understand. Hatred has two nature’s. One is as a driver for racism. 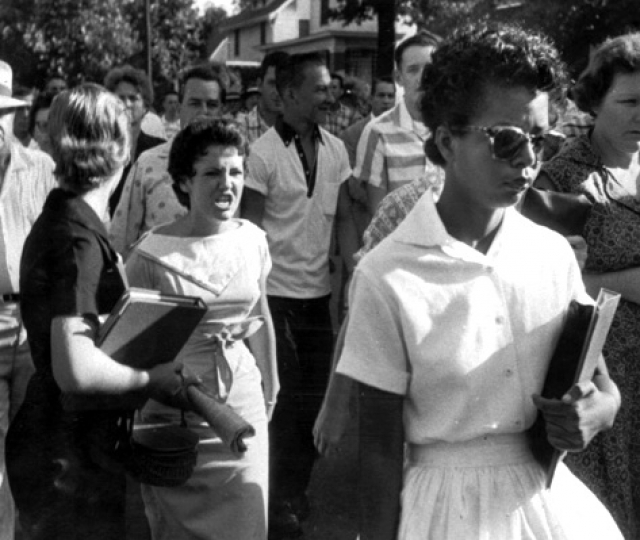 What we saw back in 1957 at Little Rock Central High School was prejudice and bigotry fueling the hatred that drove some of the citizens of Little Rock to commit some racist acts. As egregious as those acts were they paled when compared to the hate filled racist act of shooting and lynching Emmet Till, the Birmingham church bombing, the shooting of Viola Liuzzo. and the assassinations of Medgar Evers and Martin Luther King. The other is personal. It is driven by the fear of retribution the hater has of the hated. It is real, to the hater, simply because they know how they would feel were the situation’s reversed. Ok, ok, we’re not going to be able to do that. So let’s say [that] we ban racism. Racism is the “action arm” for prejudice and bigotry. Racism driven by hatred (imagine racism riding in the back of the limo, with hatred driving, chauffeur’s cap and all) strives to contain and control. Empowered by prejudice and bigotry, racism limit’s opportunity for growth. It creates laws that limit access to power. 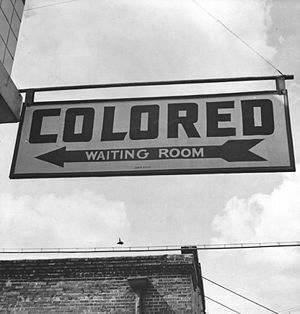 Racism is “Dred Scott v. Sandford.” It’s “Plessy v. Ferguson.” Racism is “Jim Crow laws.” Racism is “segregation now, segregation tomorrow, segregation forever,” said by, Gov. George Wallace at his 1963 Alabama inaugural. Racism is vigilante lynching’s. Racism is Rosewood, Florida and the Greenwood neighborhood of Tulsa, Oklahoma. Racism is colored only signs, it’s being forced to ride in the back of the bus. Racism is attack dogs and fire hoses. Racism is standing in the doorway at the University of Alabama, racism is the gauntlet of epithets and intimidation at Central High School in Little Rock. From past Supreme Court decisions to the current hearts of men, racism is so ingrained in our society, that banning it, well, we’re not going to be able to do that, either. So now, we have racism, driven by hatred, fueled by fear, empowered by prejudice and bigotry, then you add guns to that mix and therein lies the rub. Guns become a means of expression for these things. ( Hmm, I wonder if guns can be designated as people, and bullets protected as free speech? Make’s about as much sense as “Citizens United,” doesn’t it?) Anyway, banning these things has proven to be virtually impossible throughout our history. Battles over property or treasure can be resolved with negotiated borders. Battles over ideology seem to know no such boundaries. Let’s ban crime. Let’s make all crime illegal. Lets’s make any crime committed, that involves a gun, a special circumstance crime, with a specific set of penalties. Oops, we’ve already done that. Consider this, a group of people (any people) who have been institutionally excluded from significant segments of a society (any society), a people who have been ostracized and demonized by that society, do you see how that people would have a problem with respecting the rules of that society? These exclusions could be a result of color, creed, culture or class bias’, or any combination thereof. There are a number of thesis’ that speak to the fact that prejudice and bigotry, hatred and racism are driver’s (some say primary driver’s), of crime. Specifically, crimes against person’s. Prejudice and bigotry are used as justification for oppression. At some point, the oppressed seek relief. When relief is not found within the system, it is sought elsewhere. Racism, is the tool used to deny an oppressed people even an opportunity to grow and succeed. At some point, the denied seek redress. When redress is not given within the system, it is sought elsewhere. The elsewhere in these cases is sometimes found outside of the law. One can argue that crime justified by prejudice, bigotry, hatred and racism is not rational. That is true. But, prejudice, bigotry, hatred and racism are not rational, either. The truth is, these days there is no way to discuss guns, or race relations, for that matter. Guns, like the Bald Eagle, have become emblematic of who we are as a society. Any attack on the “right’s” of gun owners is deemed to be an attack on America itself. That, though, is not true. Owning and using gun’s, when viewed within the context of our history, shows their value. Their value, though, is as a tool, not as a god. We are allowing guns to define us, as opposed to us defining them, and their utility. As for race relations, well as long as we have prejudice and bigotry creating the fear, that is fueling the hatred, that is driving the racism…..
My thoughts and prayers go out to all of those killed, injured and victimized by this senseless act. (I’m getting so tired, so very tired, of saying that sentence.) May God bless you, keep you, and give you peace.